“If you had asked me 5 years ago that I would have a life coach, I would have laughed at you. Not me! I surely didn’t need one and by the way, I didn’t believe in them either. And then I turned 30 and realized I had dreams that weren’t fulfilled and goals that were never met. Luckily, I wasn’t completely lost – I knew where I wanted to go…but I just couldn’t figure out my path to get there. That’s where Joni came in. Not only is she just amazing and pure energy to be around, her love for what she does and her true desire to help others shines through her. It is just undeniable that she is fulfilling her purpose. I’ll admit, I was nervous at our first session (or two). I thought I might get judged or my hand might get smacked for something I did wrong. It just wasn’t like that at all. She lifted me up, empowered me and most importantly gave me a PLAN OF ACTION! I took the time to fill out my 3 month goals and we went over them, in detail. Each week thereafter she would give me little action steps to take. It was that simple. She broke it down for me completely. After a month, she sat me down and showed me that I had actually met ALL my goals for the first month!!! I was shocked, to say the least. Most people say it’s all about accountability but for me, it’s more than that. Sure, Joni holds me accountable but more importantly she teaches me that I can do whatever it is I want to do and that there aren’t any rules! She literally made it easy for me to reach my goals – goals that I have had for YEARS. “Working with Joni has been one of the most inspirational things I have ever done for myself. Joni showed me that it is possible for me to take control of my health, diet and life. She did it in a way that was fun, exciting, and really got to the core of why things were the way they were for me. Being completely hypothyroid from my 11 year stint in the military, I was lethargic, irritable, and a slave to the plethora of medications I needed to take. I had no idea there were holistic ways to help manage my symptoms, get my energy back, and feel GOOD again. “Joni has been a life long friend and when she told me of her new career as Health Coach, I knew it was the path that God had prepared for her. She’s been a student of health, nutrition and gardening for years. She also has the uncanny ability to deeply evaluate a situation, personality trait, relationship, etc, and to see multiple solutions to a problem. It is a true gift. She was the friend “confidant” when we were in school, because she was trustworthy, honest and wise beyond her years. 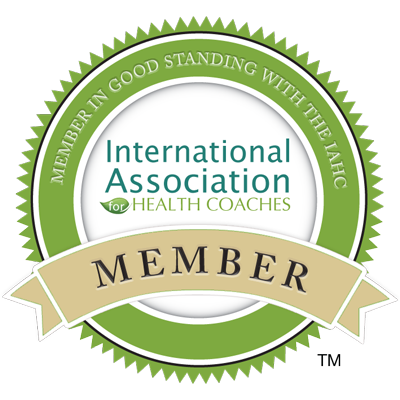 Combine those traits with her interest in health and nature to help others, the result is one fantastic Health Coach. When Joni asked me if I was interested in working with her, of course I said yes, without hesitation, partly to support my friend in her new career and partly to find some solutions to health concerns of my own. I have to admit, going into our sessions, I thought we would focus mostly on exercise and nutrition. Isn’t that what comes to mind when you think Health Coach? It has been so much more than that. Together we identified different areas of my life that were causing stress or unfulfillment. We came up with goals and manageable action plans. I’ve released guilt over silly things and I am are certainly taking better care of myself. She’s helped me to find direction in my career and marketing plans for my work. Well, we did it! I found it to be a little harder this time, but maybe that’s because I had to make sure my husband had everything too. I lost another 9 lbs, so almost 20 lbs since January!!! Jason lost about 11 lbs!! Once again, THANK YOU SO MUCH Joni!!! Your programs, your support and your friendship have changed my life! I did great! I’m so proud of myself for going outside my comfort zone and doing this! I’m also down 13 lbs! Whoo hoo!! I didn’t follow it to a tee as I have some health things that have been really distracting me but I did really well. I have lost my desire to eat at night and that is huge for me. Getting rid of fast food was also a huge victory. I believe God used your cleanse to help me get back on track and start working on my health again. I am so grateful and so blessed because I feel like I’m on a good path right now.